DB Series Hydraulic Tie Rod Cylinders | Cross Mfg. Cross DB tie rod hydraulic cylinders provide long life and reliable operation due to superior design features and quality workmanship. 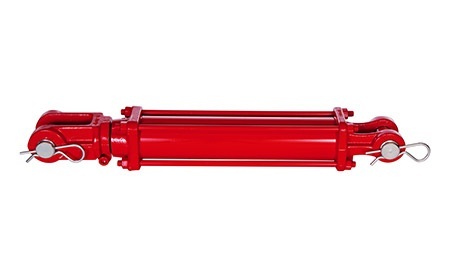 Cross DB-ASAE hydraulic tie rod cylinders are the same as the DB units except longer closed center dimensions for use where ASAE tie rod hydraulic cylinders are required. This Chart Also Applicable To DU-ASAE tie rod hydraulic Cylinders. Cross DB-ORB tie rod hydraulic cylinders provide Cross proven durability. ORB (SAE) ports assure superior sealing and minimize port damage due to overtorquing. Clevis mounting with 1" pin holes on 2" through 4" bores. 1.25" pins on 5" bores. *These cylinders are rated for 2500 psi service but the safe operating pressure is greatly reduced due to rod buckling considerations when cylinders are operated in the push mode. Please contact CROSS Engineering for recommendations. **5" bore cylinders above have 1.25" clevis pins.